One Fish Two Fish Dead Fish New Fish! I’ve had three fish in the past: Gilbert; Dr. Quinn, Medicine Fish; and Blanche. Gil lived a long fish life and died a natural death. He spent most of his life with me in residence rooms but he was lucky enough to spend the summer in Coombs. Dr. Quinn, Medicine fish had a somewhat shorter life. I believe that I’d had him for about three months when a snowstorm slammed Victoria. My apartment lost power for, if I remember correctly, four days. I was lucky enough to stay with friends but poor Dr. Quinn couldn’t handle the cold. So he was my first fish to freeze to death. Yes, I said first. This post is going to make me sound like a horrible pet owner. So I'm posting this picture to prove that I love animals and they love me. I'm basically like Sleeping Beauty, except she probably killed fewer fish. To date, Blanche has been my most interesting fish, even in her deaths. With an “s.” One day I got home from class and sat at my desk and realised that Blanche wasn’t moving much. And by “much,” I mean “at all.” Sometimes fish need a little bit of time to relax, I guess. I don’t really know. I chose English over marine biology when I realised that I hated microscopes. Anyhow, I wasn’t worried about Blanche, at first. However, a few hours went by and every time that I checked on her, Blanche was still in the same spot, completely static. Even when I tapped on the glass. It wasn’t like she was floating at the top of the bowl, but she was alarmingly stationary. That night, it was clear that Blanche was gone. I was sad, but I decided that a mourning period was necessary. Also, I probably wanted to take a break from an essay. I carried her into the bathroom and ceremoniously paused for one last check: definitely dead. I poured Blanche, along with some of her water, into the toilet. She landed with a gentle splash and I placed her bowl beside the sink. When I turned back to the toilet to flush, however, my dead fish was gone, replaced with a fish that was very much alive and gleefully swimming around the toilet bowl. Blanche had completely outsmarted me and tried to pull a Nemo! Well, I’m sure the little tart was sorely disappointed to see the blue net swooping towards her to carry her back to the confines of her fish bowl. Blanche lived for several more months. In fact, she was still alive and kicking (splashing?) when it was time to move back to Ontario. My friends and I were doing a road trip from Vancouver Island to PEI, dropping my stuff in Ontario along the way. I packed Blanche in a lovely screw-top Tupperware container and we embarked on our journey. There was a minor hiccup when her container got knocked off a counter in Coombs and she went on a kitchen-floor adventure. Still, she survived. You kind of have to squint, but here are Laticia, Blanche and I in the Rockies. Despite how much time we put into planning this road trip, we had underestimated how cold it would be in the beginning. So we stayed either in motels or with family for the first few nights. After crossing the border into Manitoba, we decided to rough it. We set up our tent put on as much clothing as we could fit on our bodies, although we didn’t think it was going to be that cold. We had a brief debate as to whether it would be warmer for Blanche to stay in the car or come into the tent. We decided the car, since it had a bit of heat left from the day. The next morning we woke up a little frosty. It wasn’t until we turned on the car that we saw it was -4 degrees Celsius. Poor Blanche didn’t make it. Still, I wasn’t entirely convinced that she was dead. I mean, first aid has taught me that you’re not dead until you’re warm and dead. Plus, I wasn’t going to let Blanche trick me again! So we travelled on towards Ontario while Blanche floated at the top of her Tupperware. Mid afternoon I had accepted that she wasn’t coming back to life and that I had frozen yet another fish. We bid her a fond farewell at a waterfall, the kind of place I imagine she sought when she faked her death. Blanche's final resting place -- until she floated downstream. But anyhow, what is it that they say? Fourth time’s the charm? I’m pretty sure that’s the saying. Well, Internet, I would like you to meet Peter Mansbridge. Here’s hoping that he’s less of a diva. It's difficult to take a good picture of a fish. Hi Peter Mansbridge!! 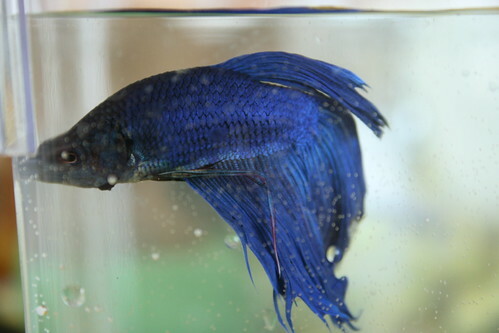 He looks just like my Charles Darwin…unfortunately he only lived for a few days after I decided to introduce a water plant into his bowl…oops. Here’s to a long and happy life for PM!! Can I just say you are the best fish namer in all the land? Thanks Devon, but I have to give credit to my friend Andy. She gave me the name suggestion for Peter Mansbridge.